Whatever you have, thank God. If you don't have shoes, thank God, because there are some people without legs. 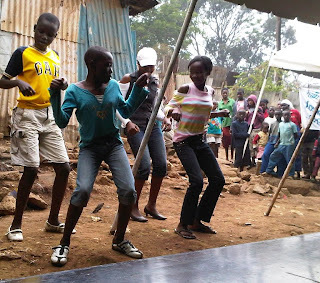 This past Saturday, I had the opportunity to speak with one of my best friends (Steve) at a youth rally that he helped organize in the Mathare slum (the theme was Break Free). Although I felt completely inadequate and unqualified to speak to a group who has endured so much, I knew it was an invitation I couldn't turn down. 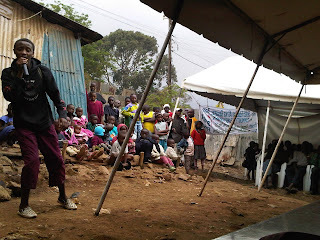 As we sat with the Mathare community, we were so inspired by the speakers, singers, dancers and artists that came before us, and considered it such a blessing to be surrounded by so many talented and gifted individuals who were able to discover true joy in spite of the poverty surrounding them (see pics below). Went it came our turn, Steve and I spoke about overcoming our failures and considering trials and tribulations as stepping stones (not stumbling blocks) in the pursuit of our dreams and aspirations. We talked about our own failures (a first for me, publicly), about the unconditional hope and future that exists for all of us*, and how we believe that distractions are created to discourage and diminish us from realizing this future**. He went on to say that he had just found out that his uncle had passed away that morning. Literally minutes before we started speaking, he received a call with the news… Again, absolutely speechless. He then shared with us his vision and how our message encouraged him and uplifted him more than we could know. I honestly could not believe my ears. He said he believes that God wants to use him to do great things, but that the enemy is trying to blot out his dreams so that he will surrender them. Even as Patrick was expressing how thankful he was for our message, I was thinking about how the benefit was all ours: the ability of this man to even get out of his bed, leave his home, serve at this youth rally and share his story with us speaks volumes to the faith and strength that he has found. For this strength, I am eternally grateful and inspired. And will never forget his story. New friends, local genge artists and dance parties. Let us start wherever we are by declaring enough is enough… We must not wait until we die of hunger and thirst. We must take action and reverse this process. Maize (corn) is the primary staple crop in Kenya -- The food security of the country single handedly depends on its production and availability. People consume far more maize than any other food (~37 million 90-kg bags a year, more than 1/3 of the calories and proteins consumed in the country), and around 4 million Kenyans are small-scale producers of the cereal grain. As a result of the drought, maize productivity has been severely diminished (see the picture in part 1). The government is predicting that only 20 of the 37 million bags will be produced this year (private institutions are predicting 15m), which will expose nearly the entire country to food insecurity. It also significantly affects the price of maize, which becomes extremely burdensome for the majority of Kenyans who are net consumers (including the majority of small-scale farmers). The NGO that I am working with has decided that enough is enough -- something more needs to be done before more lives are consumed by hunger. Fortunately, many large scale donors have come to the same conviction (e.g., the Obama administration has doubled USAID's budget for food security to $1B and the G8 has committed $20B to sustainable agriculture development over the next 3 years). So we have begun to research and analyze the entire maize value chain -- with the intent of identifying best practices, marketing gaps, areas for improvement, etc. -- so that we can develop a strategic plan for how to enter and hopefully advance the industry. The vision is to not only present productivity recommendations, but more specifically to suggest (and eventually implement) a business model in which farmers can work together to increase and optimize the post harvest marketing/selling of their yield. As the lead consultant on this proposal effort, I have spent my first few weeks pursuing conversations with numerous industry players and diving into as many reports, publications, news clippings and thought leadership pieces as possible. While this has certainly proven to be a huge undertaking, and there is undoubtedly an overwhelming amount of work ahead, the potential impact is nothing short of life changing and sadly long overdue. In spite (or perhaps as a result) of the heightened sense of urgency and responsibility, it's very inspiring to be a part of a project with so much potential, and I'm eager to continue to share our progress as we stumble forward. Our tears are sacred. They water the ground around our feet so that new things can grow. Kenya is crying for rain. The country is suffering from one of the worst droughts in its history and is on its way to becoming one of the most rain deficient countries in the world. 1. Electricity has become sacred, as 70% of Kenya is powered by hydro electricity plants (one of which was shut down last month, leaving only 7 plants to support the country). In response, the government has begun rationing power to residential areas -- Even our house in Nairobi is without power three days a week. Personal inconveniences aside, one can imagine the toll this has on the economy, foreign investment and especially small businesses, which are being forced to shut down. 2. Livestock is suffering: over 150,000 cattle have already died and another 200,000 have fled to Ethiopia. Dairy farmers -- who sell milk from their cattle as re-occurring revenue streams -- are being forced to sell their goats and cows to butchers, before the cattle die of starvation. And because there are so many farmers stuck in this paradox, they are receiving prices significantly below market rate. 3. People are starving: the government has announced that 11 million are in need of food. Food insecurity has rapidly become the most pressing issue challenging Kenya. No other sort of development can take place if the basic needs of hunger are not being met. And although there have been red flags for months, the government can no longer ignore the crisis and initiated an emergency plan for food aid last week. Sadly, most fear it will be far too little. It has become overwhelmingly obvious that something more needs to be done. 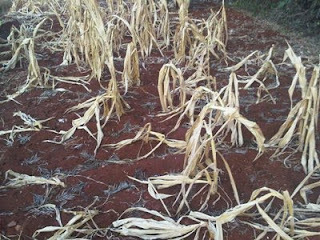 Maize crop that has failed to harvest due to the deficient rain. As I begin to explore Kenya for the third time, I am constantly reminded that the challenges facing the country are ceaselessly complex and copious. Millions are starving as the country suffers through a severe drought, formal unemployment is climbing near 70%, justice has yet to be delivered from the post election violence, and disease continues to erode the health of the people. The world is all mess up. The nation is sick. Trouble is in the land: confusion all around. That’s a strange statement. But I know, somehow, that only when it is dark enough, can you see the stars. I see God working in this period in a way that men, in some strange way, are responding. Something is happening in our world. The masses of people are rising up. And wherever they are assembled today, whether they are in Johannesburg, South Africa or Nairobi, Kenya… the cry is always the same: "We want to be free." This cry is now a cry for economic freedom. A cry for empowerment; for sustainability; for opportunity; for dignity, not dependence; for a hand up not a handout*. And the cry is loud. My prayer is that during my time in Kenya, the stars will begin to shine bright enough to blind out the darkness and the cry for economic freedom will begin to soften. *Vision statements from the two NGOs that I plan to support. 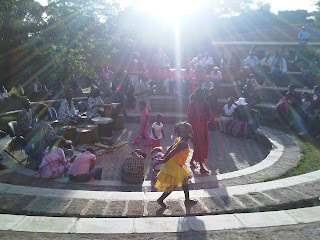 This picture -- taken at a concert at the Nairobi Nat'l Museum -- reminds me of what freedom can feel like: a little girl dancing carelessly in her yellow dress and brightly painted face to perfect percussions. 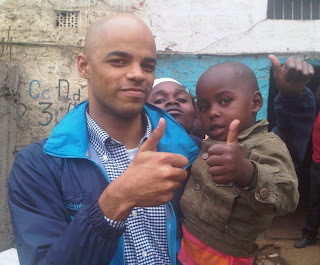 Seven days ago, I traveled to Kenya for the beginning of a six month sabbatical in Nairobi. I have debated and wrestled with the idea of keeping a blog for several months now, and have finally succumbed -- the deciding factor perhaps best represented by the following idea from Elizabeth Elliot: An aspiration to gather up the fragments that remain. So much has happened in this first week that I've realized it would be nearly impossible to recount everything upon my return. Every Boabab flower, Kiliguni sunset, glass of chai, bite of chapati, word spoken, hand shook, tear dropped, and smile shared has left a profound impression on me, and I hope to document these so that, if for nothing else, I can remember them more completely as time progresses. 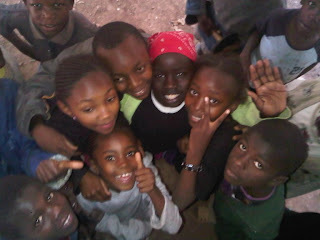 And although I trust that my inadequate words and highly pixelated camera phone pictures will fail miserably at documenting these amazing memories, it's my hope that they might provide even a computer screen-sized window into what is going on here in the beautiful land of Kenya.